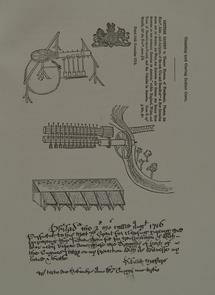 Illustrations of Sybilla Masters' patented inventions for cleaning and curing indian corn. Caption reads: "Cleaning and Curing Indian Corn." "Letters Patent to Thomas Masters, of Pensilvania (sic), Planter, his Exec. Admin. And Assignes, of the sole Use and Benefit of 'A New Invencon Found out By Sybilla, His Wife, For Cleaning and Curing The Indian Corn Growing In The Severall (sic) Colonies In America,' within England, Wales, and Town of Berwick-upon-Tweed, and the Colonies in America. Teste R, ap Westm."